Samsung Galaxy S5 Does NOT Shoot 240fps. It Shoots 120fps and Plays It Back at 15fps. 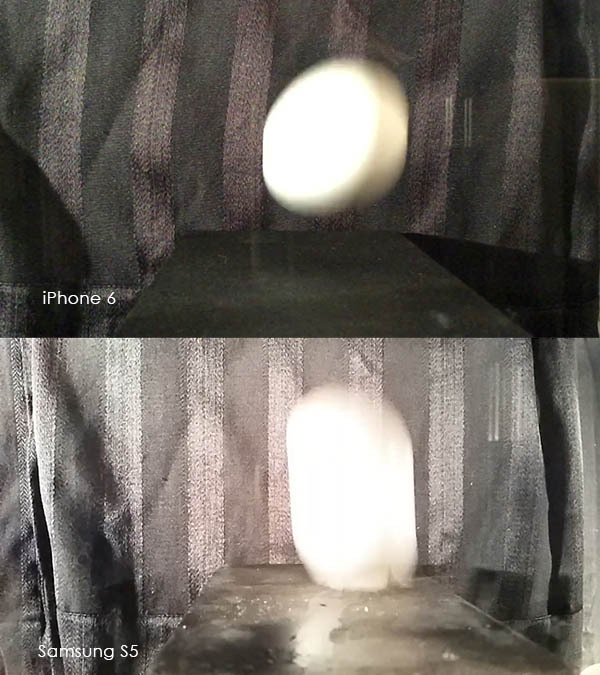 Apple’s iPhone 6 and the Samsung Galaxy S5 both shoot 240fps (or so you might think… 1/8th speed at 30fps is 240fps). Since we make Flicker Free, a plugin that removes flicker that occurs when shooting at 240fps, I thought it’d be cool to do a comparison of the two phones and post the results. However, there was a problem. The footage from the Galaxy S5 seemed to be faster than the iPhone. After looking into a number of possibilities, including user error, I noticed that all the S5 footage was playing back in Quicktime Player at 15fps. Could it be that the Samsung S5 was actually shooting in 120fps and playing it back at 15fps to fake 240fps? Say it’s not so! Yep, it’s so. Overall, very disappointing. It’s a silly trick to fake super slow motion. It’s hardly shocking that Samsung would use a bit of sleight of hand on the specs of their device, but still. Cheesy. Also, the overall image quality of the iPhone was superior. But that’s something I’ll talk about when I actually compare them! That’s coming up next!